Greetings again from the darkness. Each year provides us with (at least) a few hidden gems sprinkled amongst the superheroes and newfangled special effects displays, and although this feature film debut from filmmaker Cory Finley is only now hitting theatres, it seems safe to say it likely won’t draw the size audience it deserves. If you enjoy dark, twisted, and devilishly clever films, you owe it to yourself to track down this one. Olivia Cooke (ME AND EARLY AND THE DYING GIRL) stars as Amanda, someone who walks a miniscule line between neurotic and psychopath. The startling and quite ominous opening features Amanda, a horse, and a large knife. 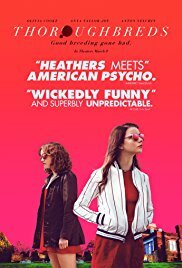 Next, and some time later, we see Amanda re-connecting with her childhood friend and boarding school brainiac Lily (Anya Taylor-Joy, SPLIT and THE WITCH) in what appears to be a tutoring session being held in the palatial estate where Lily lives with her mother and “evil” stepdad Mark (Paul Sparks). What follows is the mind-bending, winding-road of us attempting to fit either or both of these characters into some “normal” category of human behavior. Instead, what lies beneath is slowly unsheathed. As Amanda and Lily interact, we especially come to realize that Amanda is drawing out what’s behind the proper front that Lily wears on a daily basis. A plot to murder the stepdad is developed, and caught in the wicked web is Anton Yelchin as Tim, a dreamer and schemer who quickly realizes the trouble these two bring. This was one of the last roles Yelchin filmed before his tragic death. His brief time on screen here reminds us of his immense talent. An atmosphere of dread and pending doom hovers over most every scene, yet somehow it’s simultaneously funny and disturbing. We find ourselves asking if it’s OK to laugh at some of the exchanges. As Amanda explains she’s “not a bad person”, the line makes us chuckle, while also making us realize she actually believes it and we shouldn’t! As she teaches her tutor Lily “the technique”, we become convinced the line has been crossed into psychopathy. Suburban Connecticut and its corresponding privileged life has rarely generated more queasy feelings, and with our hope for humanity in the balance, we watch Amanda and Lily bounce from plotting to problem solving and from conspiring to collaborating. The absence of empathy goes beyond disconcerting and into a feeling of resolved fear. The lack of emotions and empathy can be more frightening than vampires or fictional monsters. Cinematographer Lyle Vincent does nice work displaying this world, and he will always deserve a mention after his sterling work on 2014’s A GIRL WALKS HOME ALONE AT NIGHT. The dark, twisted work is well accompanied by the abrupt and jarring music, and filmmaker Finley deserves recognition for crafting this creepy corner of a universe none of us want to join. His film is in the vein of something Yorgos Lanthimos (THE LOBSTER) might deliver, and that’s quite high praise for oddity … in fact, Odin Impetus Lowe even gets a screen credit, and he’s the opening scene horse! Greetings again from the darkness. Somewhere along the line, the magic of movie romance has been lost. Love stories these days tend to take either the direction of snark or sap (or whips). Ever so popular in the 1940’s and 50’s, well-written sentimentality for the big screen would best be described these days as passé’. 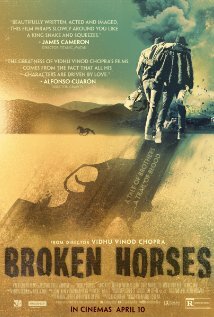 And that’s what makes writer/director Victor Levin’s little film such a pleasure to experience. We begin with a narrator proclaiming that some of the best writing is found on the tribute plaques attached to the benches within Central Park. Those plaques are used a few times throughout the film to drive home a particular situation or status within the story. The narrator is Brian (Anton Yelchin, Star Trek), a 24 year old struggling writer whose parents want him to give up his writing dream and head to law school. One day, while walking through the city, Brian catches a glimpse of striking woman smoking a cigarette. He crosses the street and the two exchange some clever banter. Just like that … the story begins and their lives are forever changed. The woman is Arielle (Berenice Marlohe, Skyfall), and she is French, older than Brian, and married … 3 things that are equally problematic according to his dad (Frank Langella), though his mom (Glenn Close) is just thrilled someone likes her boy. As the flirting escalates, Arielle proceeds to explain to Brian that she is open to seeing him daily between the hours of 5:00 pm and 7:00 pm. Familiar with French language, but unfamiliar with customs, Brian is brought up to speed on “cinq a sept” affairs – a tradition in France, where a married person’s whereabouts are not questioned during the period after work and before home. As you might guess, the affair does wonders for Brian as he is finally experiencing the world … passion … connection. Arielle opens his eyes and mind to many things, and Brian is especially taken aback as the lines blur between family and outsiders. This leads him to meet Jane (Olivia Thirlby), who is not just a rising young editor, but also the mistress to Arielle’s husband Valery (Lambert Wilson). Yes, it’s a tangled web that’s woven. Mr. Levin’s script is remarkable in its effectiveness at providing the awkward situations with a dose of humor; and his targets include Jews, the French, and Americans and their customs. It’s impossible not to think of the classic film The Graduate, or even Linklater’s “Before” franchise, but this one is different … it does not shy away from sentimentality, romance or emotion. The film wears its heart on its sleeve – or more aptly, the screen. We feel (good and bad) right along with the characters. The camera only uses close-ups when it must, and instead allows the scene and the characters to breathe. There is a simple looking, but wonderful shot of Brian and Arielle walking through Central Park directly towards the camera. They are in discovery mode towards each other, and it’s fascinating to listen and watch. Anyone who fancies themselves a writer will tip their cap to no less than eight lines that are near perfection. Being “too happy to write” is certainly a relatable emotion, but few films feature better last lines than this one … if only we could each be that one reader to which the line refers. If you are open to some heartfelt sentimental romance, then give this one a watch. If not, you’ll certainly find no shortage of reviews from caustic critics so quick to rip a film lacking in snark and sarcasm. Greetings again from the darkness. The writings of Shakespeare are certainly timeless and it’s often quite fun to watch filmmakers or stage directors bring The Bard’s stories into a contemporary setting. A fine example is director Joss Whedon’s modern and quite enjoyable twist on Much Ado About Nothing a couple of years ago. Director Michael Almereyda had success with his modern day Hamlet in 2000, and here he re-teams with his Danish Prince from that one (Ethan Hawke) to bring one of Shakespeare’s lesser known “problem plays” to screen. 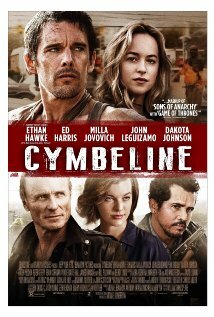 This modernization turns King Cymbeline into a Biker gang leader (Ed Harris) as he battles not the Romans, but rather a corrupt police force led by Vondre Curtis-Hall. As one would expect there is no shortage of deceit, violence and love of the “wrong” person. There are numerous sub-plots intertwined with the desire of the King and his Queen (Milla Jovovich) to marry her daughter (Dakota Johnson, 50 Shades of Gray) to his son (Anton Yelchin). Before your stomach turns, it should be pointed out that both kids are from previous marriages. It’s not surprising to discover that the daughter is really in love with someone of whom the Royal parents don’t approve – a brooding skateboarder (Penn Badgley). The assembled cast is quite impressive. In addition to those previously mentioned, we also have Peter Gerety, Bill Pullman, Delroy Lindo (always great), John Leguizamo, Spencer Treat Clark (the kid from Gladiator) and Kevin Corrigan. The issue here is not the acting talent, but rather that some seem more comfortable with Shakespeare speak than others. Hawke, Yelchin and even Ms. Johnson seem to embrace the dialogue, while Leguizamo, Harris (in his shiny new leather jacket) and especially Badgley are fish out of water. And for some reason, Ms. Jovovich is mostly wasted despite adding much appreciated spirit to a couple of scenes. Describing this as Shakespeare’s “lost masterpiece” is quite a stretch, but there is always some pleasure in hearing his words spoken. It’s just a shame when the project lacks energy and is lethargic in pacing … two elements that prevent us from ever connecting with any character. Still, any film that features a sky blue AMC Pacer can’t be all bad. Greetings again from the darkness. The Sundance Film Festival got it right when it awarded this film its Grand Jury award. This is wonderful independent filmmaking – the kind that draws in our own emotions and makes us feel what the characters feel, while also forcing us to deal with our own memories. If you enjoy fluffy Hollywodd rom-coms, you may not have what it takes to watch this raw “first” love story. I felt tightness in my chest and an aching in my bones … and I am a grumpy old man! I have been on the bandwagon for Elizabeth Olsen‘s breakout performance in Martha Marcy May Marlene. Without hesitation, I will say that Felicity Jones deserves the same accolades. It’s her first US film, but she is flat out spectacular in conveying deep emotional swings. I will see this one again just to watch her every blink and nod. She comes across as a fantastical blend of the Mara sisters – some of Kate’s radiance mixed with Rooney’s deep soul. It is always exciting to see such dramatic new talent at the early stages of their career. Writer/director Drake Doremus clearly has a bond to this story as the long term relationship and themes of separation, patience and true love are played with a cutting edge reality that we rarely see on screen. Anna (Jones) falls for classmate Jacob (Anton Yelchin) and we experience the clumsiness and hopeful flirtations of their early dates. The kicker is that Anna’s student visa expires at the end of the semester and she makes the foolish decision to stay in bed with Jacob for the summer. This keeps her from re-entering the US when she tries to return to him. To really connect with this film, you need to put yourself back in the first love moment or more so, at a time when you experienced a long distance relationship. That excruciating feeling that every moment apart would never end. What had me scratching my head a bit was the fact that Jacob never packed up and headed to London to be with Anna for good. He is a furniture designer who works in a loft in Santa Monica. Thanks to the internet and the fact that people all over the world buy furniture, it seems like the perfect business to run from anywhere … say, London with your soul mate! Made me believe that possibly Jacob wasn’t as gaga as Anna. Both of them take on close companions. Jacob’s is played wonderfully by Jennifer Lawrence (Winters Bone). She is very sweet and clearly loves Jacob, which raised another question for me. What to think of those who can fall deeply for one who is not “all in” for them? Anna moves in with Charlie Bewley who also misreads the buy-in and makes the biggest mistake a guy can make … don’t ask the question if you don’t know the answer. There are some terrific scenes with Anna’s parents played by Oliver Muirhead and Alex Kingston, both whom you will recognize. Also, Anna’s publisher is played by Finola Hughes and there are a couple of odd scenes between the two so that we understand just how talented Anna is as a writer. The ending is absolutely perfect and the two future mega stars (Jones and Yelchin) capture the moment with precision and heartfelt doubt and wonderment. It’s not the clean ending we Americans have come to expect, but it’s one that loudly announces the arrival of Felicity Jones, Anton Yelchin and director Drake Doremus. I was lucky enough to attend the opening night in Dallas, and Mr. Doremus (pictured, left) was in attendance for a Q&A. Fully expecting a brooding, beret-wearing film school reject, I was shocked when Doremus proved to be charming, energetic, thoughtful and downright appreciative of comments from the audience. He explained that much of the dialogue was improvised between the actors, and that the film was made for $250,000. If you are unfamiliar with filmmaking, $250,000 is roughly what Tom Cruise gets for a breakfast budget on his films. 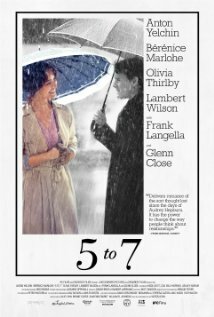 These points just made me more of a fan of the director and the film. Greetings again from the darkness. We can’t really discuss this movie without referencing the 1985 original. Writer Tom Holland was involved with both (including directing the original) and gets credit for updating the story while maintaining the look and feel. It seems as if vampires are everywhere these days, but the Fright Night recipe expertly mixes suspense, danger and campy humor. Charley (Anton Yelchin) and his single Mom (Toni Collette) live in a quiet Las Vegas suburb. Charley’s nerdy friend Ed (Christopher Mintz-Plasse) notices the place is getting quieter everyday … people are disappearing! These disappearances correspond with the arrival of Charley’s new neighbor Jerry (Colin Farrell). Yep … Jerry the Vampire. Charley at first ignores Ed’s investigative skills and concentrates on Amy (Imogen Poots), the out-of-his-league girlfriend whom he desperately wants to get to know better. And then … Ed disappears. Charley tries to push Amy aside and solve this mystery. It doesn’t take long since he breaks into Jerry’s house and discovers where he stores the bodies of his victims. As you might expect, Jerry doesn’t take well to the invasion. Charley goes to Vegas showman Peter Vincent (David Tenant) to seek help in destroying Jerry. See, Peter Vincent’s crazy Vegas show is all about fighting the evil dead among us. Of course, Vincent isn’t quite as tough off stage. There are plenty of moments of campy fun as Charley pursues Jerry. Not the least of which is a fender bender which includes Chris Sarandon, who played Jerry in the original. While it’s a nice homage, it just made me miss Roddy McDowall, who originated the role of Peter Vincent. Still, watching McLovin as a tough-talking vampire is quite a bit of fun as are the few moments of doubt from Collette and Poots. Craig Gillespie directs the film, and his success a few years ago with the indie hit Lars and the Real Girl brings an added touch of class to the film. He really does a nice job of balancing the terror of the story with the humor necessary to make this one enjoyable and a bit different. A tip of the cap to the casting of the movie. Yelchin (Star Trek, The Beaver) is a real up and comer. Ms. Poots was very effective in Jane Eyre and it will be interesting to follow the direction of her career. Collette is a real pro. Colin Farrell seems to really enjoy his turn as a vampire and adds some subtleties and quirks that make it fun. David Tenant (“Dr. Who”) really captures the Vegas Peter Vincent. Mintz-Plasse is one of the few who can effectively bounce from high school nerd to powerful vampire. Must also mention some hidden gems: singer Lisa Loeb makes a quick appearance as Ed’s mother, Charley’s friend Mark is played by Dave Franco – brother of James (you will spot the resemblance), and Peter Vincent’s girlfriend Ginger is played by Sandra Vergara, sister of Sofia from “Modern Family” (again, you can’t miss the resemblance). In this day and age, it isn’t easy to assemble such a strong cast, script and director for a movie that isn’t centered around alien action, terminal disease or toilet humor. If you enjoy campy horror films done with an acknowledged tongue planted in cheek, then I recommend this one. It delivers exactly what you hope and expect.